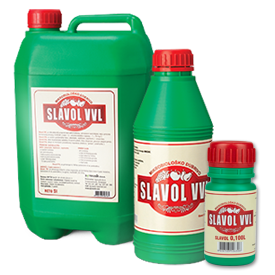 SLAVOL VVL – microbiological, organic, liquid fertilizer for foliar supplemental feeding of fruit and grapevine and planting material production. Bacteria producing indol-3-acetic acid are selected with a special selection procedure. Indol-3-acetic acid found in SLAVOLU VVL is completely of natural origin and it is derived with microbiological fermentation. In addition to certain bacteria, auxins are synthesized by young plant tissues – meristems of shoots, roots, young leaves and pollen, fruits that develop, apex. Auxins are transported with the conducting phloem vessels and from cell to cell. Auxins belong to a group of plant hormones that act stimulatingly on all physiological processes in plants. NITROGEN-FIXERS – associative bacteria that fix nitrogen. PHOSPHORUS MINERALIZING BACTERIA – bacteria that decompose organic compounds of phosphorus.